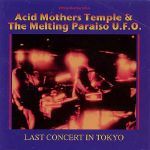 Acid Mothers Temple The Melting Paraiso U.F.O. Complete document of the last gig that Acid Mothers Temple & The Melting Paraiso U.F.O. played in Tokyo in February 1999. The gig was also Tsuyama Atsushi’s first with AMT after officially joining the group, and it look place about a month before the release of “Pataphisical Freak Out MU!!”. In spite of the fact that this was our third gig in Tokyo, less than thirty people showed up at the venue. AMT has not played in Tokyo since and understandably they have little intention of doing so in the future. AMT’s line-up at this period in the group’s life has long been whispered of amongst the cognoscenti as the best ever. For various reasons Koizumi stopped playing live in autumn 2000, but this line-up is still frequently reconvened for AMT recording sessions. This year (2003) Koizumi has finally been persuaded to return to playing live, and so once AMT returns to full-scale live activities next year (2004) it will be at max strength once more.